“Stories are the most important thing in the world. Without stories, we wouldn’t be human beings at all.” Philip Pullman. 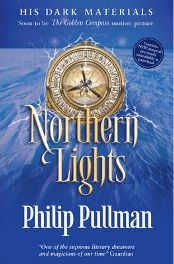 Not so long ago, my search for something new and interesting to read brought me to the covers of “Northern Lights” by Philip Pullman. For those of you unfamiliar with the title, it is book one of the His Dark Materials trilogy; a publishing phenomenon that I’m sure will have filtered into your consciousness on some level over the past few years. Now, I am not normally one to read children’s books (although in my defence, the author does actually say that his did not intend this to be aimed at any particular target audience; it was for adults as much as for children) but I was motivated to read this after a number of promising personal recommendations, and good reviews. Northern Lights is a book set in a world that is like ours in many ways, but is yet very different. In this world lives Lyra, a girl left to be raised amongst the staff and scholars of Jordan College in Oxford, a sprawling mass of gothic buildings, great halls, subterranean passages and secret crypts that beg to be explored. And explore them she does – usually accompanied by her friend, the college kitchen boy Roger. The scholars for the most part forget about her existence and overlook to give her lessons, but despite being very bright, Lyra is quite happy with this state of affairs. It gives her plenty of time to roam the college buildings and play with the gyptian children who turn up in Oxford aboard their family’s barges from time to time. It also allows her almost total freedom, time to wander, to fight with non-collegers, and to run through the city streets with the packs of children whom she assumes leadership of. Having no family of her own never worries the fiercely independent girl though, and never does she feel lonely – in fact, no one in her world ever does, as each human is born with a constant companion. That companion is the person’s dæmon, something like their soul or guardian angel, which stays close to them in an animal form throughout their life. As a child, Lyra’s dæmon Pantalaimon still has not settled on one constant form, and so he changes to suit her mood, desire or situation. As she grows up, Lyra’s true personality will become apparent, and it is only at this point that Pantalaimon will take on his true form in reflection of this. This can be seen very clearly in the servants of Jordan College, as no one may be a servant unless his or her dæmon is a dog (reflecting their steady loyalty, faithfulness and desire to be working within a known and understood hierarchy). This safe world starts to change on the day that Lyra decides to sneak into the Retiring Room, knowing full well that only the important men of the college are allowed in there. Driven by her curiosity, Lyra eagerly explores the room, but is driven to hide in a wardrobe after an unexpected guest arrives at the college and is shown to this room by the butler. From her hiding place, Lyra can see that the guest is her Uncle, Lord Asriel, a man who pays the occasional visit to her at Jordan – but this time he has come for something quite different. Having recently returned from an expedition to the North, Lord Asriel has some slides to present to the scholars, showing things that Lyra had never even dreamed of. Beautiful coloured lights in the sky (some apparently showing a city in another world), curious pictures illustrating something he refers to as Dust and the talk of the armoured bears of Svalbard captivate her. This is all Lyra can think about until something else arrives in her Oxford to distract her – news of children going missing across the country, vanished without a trace to some sort of monsters known as the gobblers. No sooner has the news arrived, than a local gyptian boy falls victim to them, and later Roger himself. This all leaves Lyra with much to think about. Where has Roger gone and who are the gobblers? What is this secret compass and how does she read it? And what is so important about the mysterious Dust that Lord Asriel and the scholars got excited about? Phillip Pullman himself lives and was educated in Oxford. Not wanting his novels to be constrained by the limits of our world, he has taken the city he knows so well and placed it in an alternative reality that is based partly in folklore and partly in mythology. There is a great amount of originality in the mixture too, most notable in the creation of the dæmon. As Pullman says: “I found that a very good way of demonstrating the difference between children and grown-ups, between innocence and experience – the sort of infinite potentiality children have, the great malleability of their characters. They change very quickly, their moods change. Grown-ups don’t have that. We’ve lost that, but on the other hand, we’ve gained something as well. We’ve gained a sort of settle strength, a singleness of purpose which will carry us through to the destination which we’re aiming for”. This theme, which is reflected in the dæmon, proves to be very important throughout the trilogy. Pullman’s position as an atheist is also very clear. In Lyra’s world, the Church is a body of great power and influence, able to carry out inquisitions, have heretics arrested and control scientific publication into anything that may challenge its authority and dogma. The sinister nature of many of the Church’s activities leaves little doubt as to the author’s personal beliefs. Northern Lights is often recommended to readers who have enjoyed the Harry Potter series, and while the two may both have that strange ability to appeal to all ages and backgrounds, they remain startlingly different. Where Harry Potter is a derivative story (you can find similarities in many earlier works, such as The Worst Witch books, for example), Northern Lights is unique and original. Pullman has in this book created a timeless and complex world, completely believable for all its talk of witch queens and armoured bears. This world is close enough to ours to not need complex descriptions and maps in a Tolkein style, but has sufficient fantasy and mystery about it to make the reader fascinated and curious about the universe that Lyra inhabits. (In other words, it knocks Harry right back into the sorting hat). I think Northern Lights also manages to operate on many levels, which explains this ability to be readable to such a wide audience. At its most basic, this book appeals to younger readers as a good fantasy adventure story, and with an element of children outsmarting grown-ups, which is always going to be popular amongst kids! For older readers, there is the added attraction of an intelligent and rather ingenious reasoning behind the whole story; it is something that will really get you thinking about the plot and why everything that happened, happened. Finally (and if you want to analyse the text this much) you can look at and think about Pullman’s careful use of language. He is rather keen on giving out Greek names: Pantalaimon is derived from “Panteleimon”, the Greek for “all merciful” in reflection of her dæmon’s attitude towards Lyra; the alethiometer is Greek for “truth meter”, in regard to its ability to answer any question Lyra asks it. Pullman also carries on the ecclesiastical theme by naming Lyra’s uncle Asriel – Azrael was one of the four archangels, more specifically the angel of death (the reason for which will become apparent when you read the book). Overall, I found Northern Lights to be a very good read – absorbing, compelling and fascinating. But not perfect. One thing that niggles a bit to me was the opening two chapters; you are plunged straight into the action and not given any real context for it for a considerable length of time. This left me feeling a little lost, and I have to admit at this point I was less than keen about continuing; it took a while longer than normal for me to “get into” the text. I have to admit that the only real reason I did continue was because I had bought the book and felt obliged to – had it been a library book, I would probably have not, and simply dismissed it as being over-hyped. It is a weak spot, but certainly not a major problem overall. The rest of the writing is nothing short of superb. I feel confident in recommending Northern Lights to all readers aged 10 and up. Northern Lights was published by Scholastic in 1995. Please note that in the US, it is titled “The Golden Compass”. Northern Lights won the Carnegie medal for an outstanding book published first in the United Kingdom in 1995. 2 Comments on "Northern Lights"
I adored Northern Lights, particularly the relationship between human and daemon. I’ve since read The Subtle Knife, but I wasn’t quite so taken by it – and haven’t got round to finishing the trilogy with The Amber Spyglass yet. Will be interested to hear your thoughts on those if you read them.